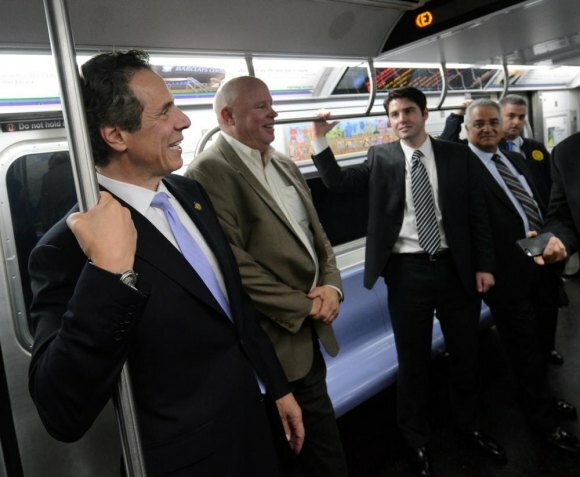 Governor Andrew Cuomo with MTA executives after opening the Second Avenue Subway. Governor Andrew Cuomo's negligence toward Roosevelt Island may or may not be intentionally anti-democratic, but in the end, what's the difference? RIOC's Board of Directors is near collapse, and the fault is entirely Cuomo's. It didn't take long for a new Governor Cuomo to actively subvert the democracy movement on Roosevelt Island. Sworn into office in January, 2011, by June, he began tearing down the carefully constructed resident power structure built to reform RIOC's Board, making it more responsive to local needs. But here's the thing. He can kick them off on a whim, and he's under no statutory requirement to appoint anyone. Those facts, whether or not with malice aforethought, have allowed him to undercut hard won democracy at RIOC, not by action, but by inaction. We don't know Cuomo's motives because, as with RIOC, transparency is not a hallmark. He grabs credit for anything good but blows silent in the face of trouble. When Cuomo took office, RIOC's Board was full and active. Remarkably, seven of nine Board Members were Roosevelt Island residents, most nominated by popular ballot. 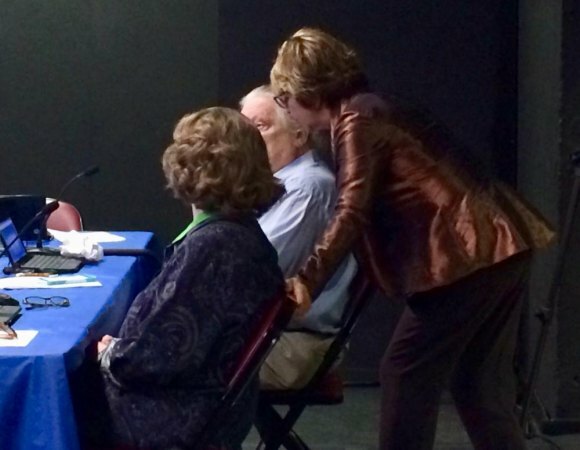 RIOC President/CEO Susan Rosenthal huddling with Board Members Margie Smith and David Kraut in 2018. In concessions won by the Maple Tree Group, set up to fight for increased democracy here, the State passed legislation enabling majority representation by residents. Two ex officio Members represent State agencies, Homes and Community Renewal and Budget. Within six months, Cuomo was busy tearing down the Board's structure, acting contrary to the democratic commitments of his predecessors. Residents were outraged when the Governor kicked off one the most popular and effective resident Board Members, Jonathan Kalkin, and replaced him with nonresident Salvatore Ferrera, Executive Director of The Child School for less than a year. Ferrera was sponsored by a Brooklyn State Senator. Local disgust was ignored in Albany, but Cuomo's act unravelled anyway when his first appointee, under a cloud of suspicion, abruptly resigned from The Child School as well as RIOC, without prior notice, on a single day in February, 2013. Ferrera turned out to be the only Board appointment Cuomo's made over eight years in office. Without Cuomo's filling the seat vacated by Ferrera, Board membership dwindled as three more residents - Dr. Kathy Grimm, Fay Christian and Margie Smith - resigned after years of uncompensated public service. Only the Governor and his staff know for sure why new nominees have not been sent to the Senate for confirmation, but the effects of neglect are inescapable. With only three residents still around, Board Members are forced to serve on every committee, requiring many extra hours of study, meetings and research. A more nefarious impact emerged into view after RIOC's administration moved, clumsily but effectively, to crush the Roosevelt Island Youth Program, a 40 year institution that residents openly supported and wished to save. 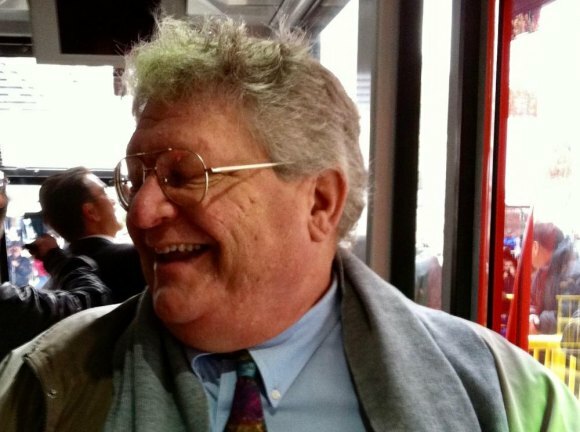 RIOC's longest serving Board Member, David Kraut. When a critical funding vote was taken, three resident Board Members - David Kraut, Margie Smith and Howard Polivy - voted to keep RIYP in business while two - Fay Christian and Michael Shinozaki - opposed. Yet the program was forced out of business because the two ex officio Board Members, from Budget and HCR, voted with the resident minority. That is, Cuomo's direct hires were able to overturn the community's voice because his neglect in appointing new Board Members gave them more power than the law enabling RIOC or its own bylaws ever intended. The situation got worse when Christian and Smith resigned, leaving resident Board Membership without the seven to two advantage held when Cuomo arrived, leaving a shaky three to two. All the State needs, these days, is to win a single resident vote, one out of three, to get anything passed. After the resignations of Marie Smith and Fay Christian in 2018, speculation was that Cuomo would appoint new directors, maybe all new directors, before the Senate session ended last summer. Cause for the speculation was that, with only three resident board members remaining, it's impossible to establish a quorum necessary to conduct business if any one of them can't attend. Two Board committee meetings were cancelled in the past month alone, at least one because of an ill Board Member. David Kraut is the longest serving Board Member and also the oldest. While he's effectively RIOC's institutional memory and a still wise analyzer of community issues, other Members express concerns about his health. Those concerns took shape in reality when Kraut recently pled sickness when declining to attend a committee meeting. Tensions ran high, and when RIOC administration could not reach him by phone, Public Safety sent officers to check on him. When they entered Kraut's residence, without permission, according to reports, they found him well... and furious over the invasion of his privacy. Neither this nor the travesty of seeing an Island institution destroyed to make way for a RIOC takeover could have happened had Cuomo done his job and kept the Board up to date with a full set of Members. Hopes are high that Cuomo will end his delinquency and submit nominees to the Senate before dysfunction cripples operations. Those hopes are tempered by fears he'll appoint people with as little insight into and connection with the community as his only nominee so far, Salvatore Ferrera.